Crowdfunding through sites like Kickstarter and GoFundMe has made everything from business startups to trips a reality for many that otherwise would not have been. The beauty of crowdfunding campaigns is that it provides a way for people to leverage their social media networks and real life friends to collect and pool together small contributions into a large sum of money for a purpose. Crowdfunding also builds grassroots support for projects, big and small. 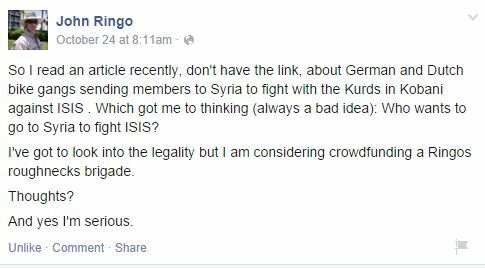 As Ringo points out, members of Dutch and German biker gangs are fighting alongside Kurdish forces in Syria against the jihadist scourge that is ISIS. A couple of Americans have already volunteered to fight alongside the YPG, the Syrian Kurdish militia. However, there’s nothing on the scale that Ringo* is envisioning. Ringo is envisioning something like a non-Communist version of the Abraham Lincoln Brigade of American volunteers who fought for the Communist-aligned Spanish Republic during the Spanish Civil War of the late 1930s. As for the legal issues, the Kurdistan Regional Government in Iraq has warned against volunteers joining the Syrian Kurds due to the YPG’s ties to the PKK, which is a Turkish Kurd political party on the terrorist lists of both the United States and the European Union. The U.S. State Department advises that serving in a foreign military is not grounds for loss of citizenship on its own. However, if that foreign military is facing combat against U.S. forces, that could be grounds for loss of citizenship. A possible grey area is that U.S. law appears to state that serving as a commissioned officer or non-commissioned officer in a foreign military could be grounds for loss of U.S. citizenship. It’s important to note that I could not find any attempts at prosecuting members and commanders of the Abraham Lincoln Brigade or attempting to strip them of citizenship for their role in the Spanish Civil War. Similiar legal issues were raised over the summer when Americans who served in the Israeli Defense Forces were killed in Gaza. Americans have had a history in serving in the Israeli Defense Forces and other foreign military units such as the French Foreign Legion. So legally, serving with the Iraqi Kurds shouldn’t be a problem. However, serving with the Syrian Kurds could be legally problematic, given their ties to the PKK. However, the PKK itself is fighting alongside the Iraqi Kurds and the U.S. is arming other Kurdish organizations designated as terrorist organizations to fight ISIS. My guess is, the U.S. would turn a blind eye to Americans fighting ISIS, regardless of what units they’re with. As for the crowdfunding idea itself, I like it. 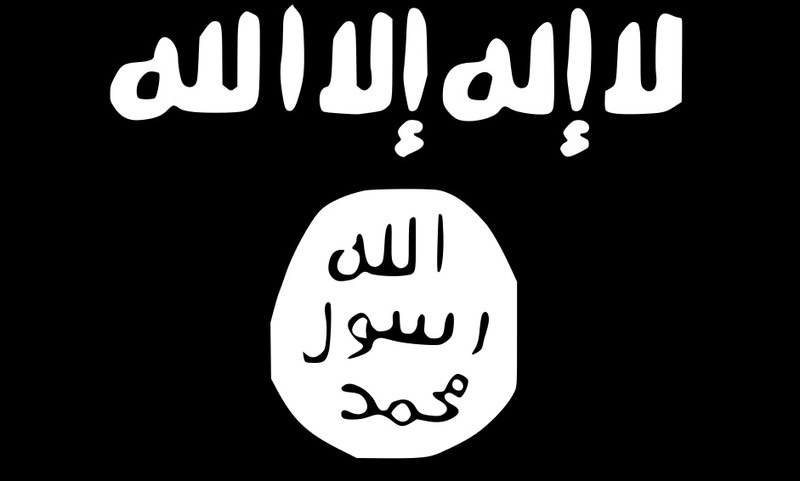 This could be a way for Americans who are frustrated with the current U.S. policy towards ISIS to step up and do more. They can give money to help American (and likely other foreign volunteers) equip themselves to fight an evil enemy. This unit can be recruited from social media. An example of this is the Donbass Battalion, which is a Ukrainian militia unit fighting against pro-Russian and Russian forces in the Donbass War in Eastern Ukraine. As its commander admits on this Vice News documentary, they recruited on Facebook and relying on donated weapons, uniforms, and provisions. This is part of a trend of decentralization in warfare that’s going to become more common. As the enemies of freedom are often stateless, the forces of liberty need to decentralize and use the funding mechanisms of peace to respond accordingly. As has been shown in Ukraine, the enemies of liberty and freedom are still often powerful states, so a decentralized means of warfare is often a necessity. As everything else has become decentralized and crowd-driven, why should warfare be any different? *Ringo isn’t the only one with this idea. One friend of mine, who has military experience as well, is working on a similiar project as well.